For quantitative determination of D-lactate (D-lactic acid) and evaluation of drug effects on its metabolism. • Sensitive and accurate. 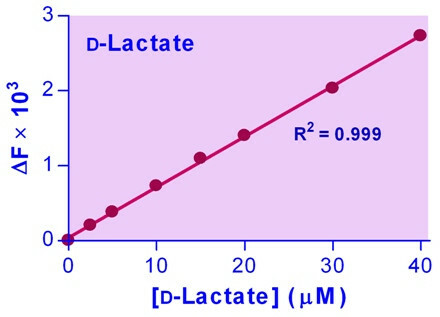 Detection limit of 1 μM and linearity up to 50 μM D-lactate in 96-well plate assay. • Convenient. The procedure involves adding a single working reagent, and reading the fluorescence after 60 min. Room temperature assay. Lactate is generated by lactate dehydrogenase (LDH) under hypoxic or anaerobic conditions. Monitoring lactate levels is, therefore, a good indicator of the balance between tissue oxygen demand and utilization and is useful when studying cellular and animal physiology. 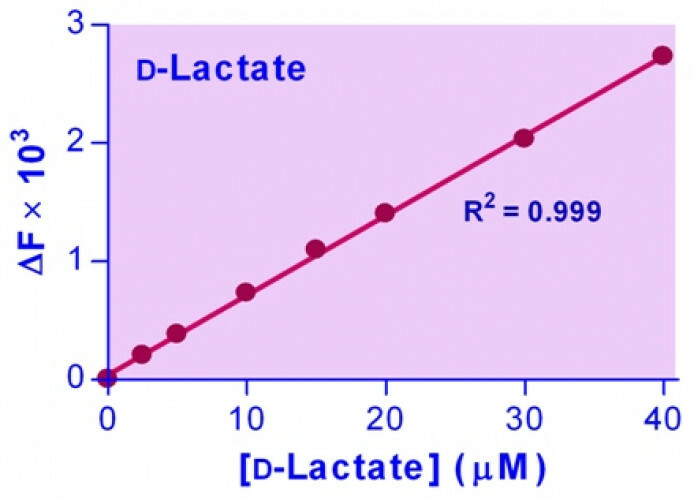 D-Lactate is produced in only minor quantities in animals and measuring for D-lactate in animal samples is a means to determine the presence of bacterial infection. Simple, direct and automation-ready procedures for measuring lactate concentration are very desirable. BioAssay Systems’ EnzyFluo™ lactate assay kit is based on lactate dehydrogenase catalyzed oxidation of lactate, in which the formed NADH reduces a probe into a highly fluorescent product. The fluorescence intensity of this product, measured at λex/em = 530/585 nm, is proportional to the lactate concentration in the sample. Applications For quantitative determination of D-lactate (D-lactic acid) and evaluation of drug effects on its metabolism.